I received an email this week about someone looking for this post from a few years ago, so since I can't seem to find the time to write anything new at the moment, I am reposting it. I did not touch this topic last year, as it is such a controversial subject among believers. There are those who feel strongly both ways. I would ask that whatever your opinion, you at least take the time to consider the following: how do we make the decision to participate or to not participate? The same way we make all decisions as Orthodox Christians, by looking at what the Bible, the Church Fathers and the Canons say. "...Whatever is true, whatever is honorable, whatever is just, whatever is pure, whatever is lovely, whatever is gracious, if there is any excellence, if there is anything worthy of praise, think about these things." So, if that is what we are to hold up and think about, the lovely, the gracious, the worthy of praise, how does Halloween measure up? There is nothing lovely about glorifying death. In fact, that is the exact opposite of what the Church is about. We celebrate life. We are weeks from entering into a time of honoring the incarnation of our Savior. We should be turning our hearts and minds to the fact that God humbled himself by becoming fully man in order to destroy death. Think about that just a minute. The One True God, all powerful, all knowing, all honorable. Put on flesh. Lived on this earth. Suffered temptation from Satan. Endured mockery, pain, death. Entered Hell. CRUSHED DEATH. FOR US. Why would we want to celebrate that which he endured so much to destroy? So, no, it is not just all in good fun. It is not just a harmless night for our children to dress up and get free candy. IT IS A NIGHT THAT HOLDS UP ALL WE REJECT. IT IS A NIGHT FOR SATAN. So, my question is "why?" Why would we WANT to participate? Because it is fun? Because it is uncomfortable to keep our kids home from school that day? Because someone might make fun of us or our children? Because we don't want our kids to "miss out"? Each morning as we read the lives of men and women who gave their lives rather than eat food sacrificed to idols, children who died rather than bow to anyone other than God, how can we ask those questions? I think of the mothers who encouraged their children to martyrdom. They weren't worried their kids would be made fun of - they were worried their children might not attain eternal communion with God. They didn't try to protect their children from embarrassment, they exhorted them to stand strong against the world, a world that hated them and their God. This world still hates us, and it hates our God. So, give your children the strength to stand against evil, teach them to be martyrs! If you are interested in reading what others have to say on this topic - here is a selection of links to articles that say far better than I what our duty is as Orthodox Christians in this world. If you have never given this issue thought, or if you are unsure about what is right, I challenge you to take the time to read at least one of these articles. Finally, on the practicality of the issue. I really do encourage you to consider keeping your kids out of school on Friday when all of the parties will be happening. Avoid too much shopping with your children over the next few weeks. I try to limit the places we go during this time, since even a trip to the local drugstore is full of nightmarish images that can affect a young one in ways we often don't realize until much later. My daughter had years of nightmares from a grocery trip to Sam's where she turned a corner to be faced with a life-sized plastic witch. The night of October 31 has always been stressful for me, with young kids how do you avoid the ringing bell? Our former parish used to have an Akathist to the patron saint of our church. What better place to be on this night, than in church, praying for the world. If your parish does not offer a service that evening, gather with a few friends (preferably in a home that is not in a suburban neighborhood if possible :) and say the prayers yourself. A friend from last year's St. Emmelia Conference just sent this to me and I wanted to share because it is just so beautiful. It was custom made for Orthodox families, the Theotokos even has three stars! 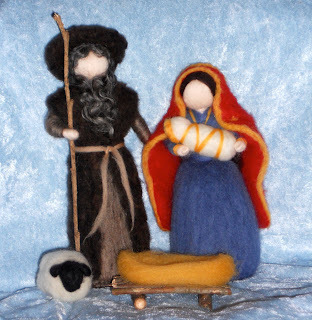 So, if you are looking to add some amazing Nativity figures to your seasonal table, go check out this etsy seller. "True hospitality is sharing your life . . . with those outside the family circle. False hospitality is trying to re-vamp your life with camouflage and pretense so that it will fool a guest into thinking your life more elegant and more picturesque than it really is." ht to Pleasantview Schoolhouse for this quote, a good reminder of this, and here's to hoping to share some true hospitality soon!